Meet Susan Tank - a Breyer Horse Collector! Sue's passion is horses and her entire life is based around them whether it be her full time job of training, giving riding lessons and boarding horses. Or customizing and collecting Breyer Horses. Above left: "Sue painting Gracie as a Zebra" - I'm usually the one with the camera in hand, so it was tough to find a photo of me and this was the most recent I could find. 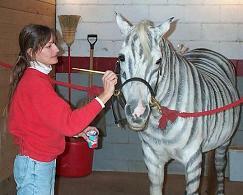 It's of me painting one of my horses as a zebra for our annual Fun Day event, where she won first place. Above Center: "Stenciled & eyewhites Black Western Horse" - A rare Black Western Horse with stenciled blaze and factory hand painted eyewhites. 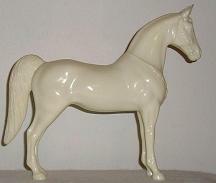 I was told by a couple Breyer experts that this horse was probably a Christmas special run for Woolworths back in the 50s. I paid $200 for this horse, but it might have a higher value. On the right: "Especially dark glossy Fighter" - An unusually dark #34 glossy grey Appaloosa Fighting Stallion. Being that I've never seen one this dark before, I can only guess his value to be close to $100, maybe more since he's in very nice condition. 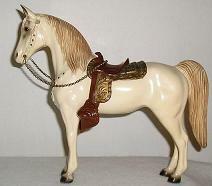 Above Left: "57 Blackfoot blonde bridle" - A very uncommon Western Horse, the "Blackfoot" is the very first Western Horse that Breyer ever made (before the grey-footeds that we all see now). This one is more than likely an early Blackfoot because of the "blonde" bridle (only center of conchos are painted gold). This one is valued at nearly $200. Above Center: "59 Creampuff" - Another rare model, especially in this condition, "Creampuff". 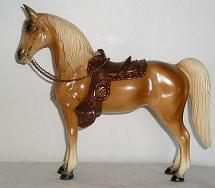 The ivory-colored plastic Western Horse with gold-brushed slip-cinch saddle, O-link chain reins, bar bit with clip attachment, "blonde bridle (only center of conchos are painted gold), brown shaded mane and tail and very dark brown hooves, eyes and insides of ears. 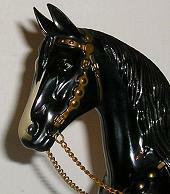 This horse is in near mint condition and probably valued over $200. Every so often I sidepass into a different hobby that I like to do with my Dad- classic cars, which we show. 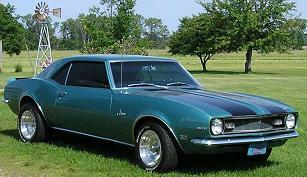 I own a '68 Camaro and I'm also a classic car show judge for our car club that my Dad and I are a member of. When I'm not playing with horses and cars, I'm taking care of my horses, other animals and farm. Someone once told me that "your a horse person when your barn is cleaner than your house" and this statement couldn't be more true when it comes to me. Above right: "Rare matte palomino Western Pony" - I only saw and heard of one other matte palomino Western Pony other than this one, which I was lucky to find, but you can bet I'm still looking for more. 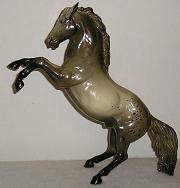 :) I can only guess at an approximate value of this horse as being around $75. He does have his saddle, but I took it off for the photo.